If you need professional cleaning of the carpets in your home, commercial or rented property, you can use our services. The carpet cleaning which we provide removes stains, unpleasant odours, dust, allergens, hairs and other pollutants. Our staff is professionally trained and have the necessary skills and knowledge to sanitize all kinds of carpets. They won’t leave any damage to the fabric of your carpets. We offer dry, steam, vacuum cleaning and effective stain and odour removal. Our company is located in London where we provide our professional carpet cleaning services. The carpet cleaning which we offer starts with initial testing of the carpet. This helps the cleaners choose the most suitable procedures to apply on the carpet that won’t cause shrinkage, stretching or colour change. They will pre-spray all obstinate stains and soiled areas and then vacuum clean the carpet. Depending on its type, our staff will either dry or steam clean it. They use special dry and steam cleaning machines for this purpose along with biodegradable cleaning solutions. After that, your carpet will be deodorized and you can use it. The carpet cleaning services which we offer are available in London every weekday and weekend. To keep your carpets longer and maintain them clean and spotless, regular vacuum cleaning is not enough. You need to have them cleaned professionally two times per year to remove the grime which is stuck deep in their fabric. 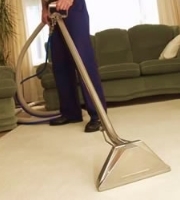 We offer dry and steam cleaning procedures which are suitable to all kinds of carpets. They extract the dust and grime effectively and cleanse the carpets well. Our carpet cleaning services are at your disposal in London every day. You can order them by calling our customer care centre, use our booking form or online chat.